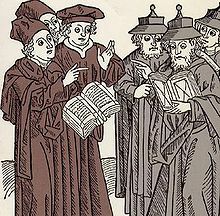 Moses Kimhi (c. 1127 – c. 1190) was a medieval Jewish biblical commentator and grammarian. Moses B. Stuart (March 26, 1780 – January 4, 1852, age 71), an American biblical scholar, was born in Wilton, Connecticut. Joseph ben Isaac Bekhor Shor of Orleans (12th century) (Hebrew: יוֹסֵף בֶּן־יִצחָק בְּכוֹר־שׁוֹר) was a French tosafist, exegete, and poet who flourished in the 2nd half of the 12th century.